THE BIBLICAL flood, a central tenet of three of the worlds great religions, was nothing to do with divine wrath: the real cause was a giant comet that hit Earth, according to new research. In the same way as Jupiter was rocked two years ago by the million-megaton impact of the comet Shoemaker-Levy, so Earth was bombarded 12,000 years ago by the fragments of a similar celestial visitor. It caused tidal waves, the mass extinction of many prehistoric species such as the mammoth and sabre-toothed tiger, and turned the world dark for months. His findings have caused controversy. More than a dozen other geologists have written to Terra Nova, a geoscientific journal sponsored by the Council of Europe, denouncing him as a fantasist. However, he has had a warmer reception in Britain where Victor Clube, an astrophysicist at Oxford University, has made similar claims for the influence of comets on human history. Tollmann, a professor in the institute of geology at University of Vienna, compared the numerous myths of a great flood, recorded in almost every prehistoric civilisation, with the geological evidence for a comet impact at about the same time. He used the two sources of information to date the flood very precisely, to around the year 9,600BC. Two discoveries are central to his claim. One is the distribution of the splinters of molten rock thrown up by the impacts, known as tektites. There was, he said, a huge concentration of them in sediments laid down about 10,000BC. Variations in the amounts in different parts of the world suggested Earth was hit by seven large fragments and many smaller ones. The other is the apparent sudden increase in radioactive carbon-14 found in fossilised trees dating back to the same era. This, said Tollmann, was due to the destruction of the ozone layer by comet, an event that exposed the atmosphere to higher levels of radiation and increased carbon-14 production. Tollmann backs his theory with folk myths gathered from the Middle East, China, India and the Americas. He said that even though all had been written long after the event, and must therefore have been handed down orally through many generations, they still showed extraordinary similarities, including descriptions of the Earth being first threatened by seven burning suns and then overwhelmed by a deluge and other disasters. Such theories overturn the idea, held by scientists for more than 150 years, that the world only changes slowly. Many now believe the Earth has suffered many random catastrophes, especially bombardment by comets and their debris, that have changed the course of history. Tollmanns findings are supported in principle by Clube. He has just published the results of 20 years research into comets and the way their paths through space intersect with the Earths. He concludes that many of the big events in history were a result of collisions with comets or their debris. The evidence for collisions with comets and meteorites is widely accepted by scientists. The last great collision happened in 1908, when a huge object exploded over Tunguska, in Siberia, with a force of up to 30 megatons, devastating an area of 50 square miles. A far larger impact, 65m years ago, is thought to have wiped out the dinosaurs. 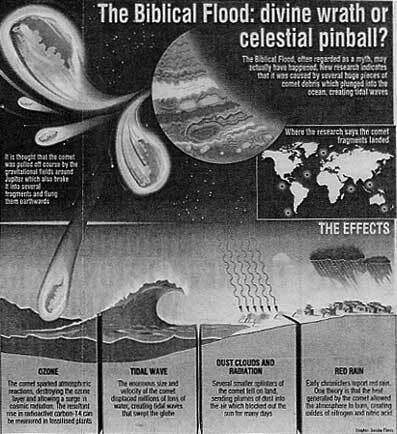 The idea that such a collision caused the biblical flood is not, however, so widely accepted. Some scientists point out hat low-lying areas the world over would have been beset by floods at that time. The worst would have been caused by the shrinking of the ice caps at the end of the Ice Age. Water released from the ice caps increased sea levels by 300ft between 18,000BC and 30,000BC. The flood is central to early Jewish and Islamic writings, as well as Christianity, where Bible records that it rained for 40 days and 40 nights. The waters, ridden by Noah in his ark, subsided after 150 days.